Compare Cat Toilet Training Kits: Litter Kwitter or CityKitty? You may be surprised to stumble upon this review on toilet training cats! But, yes, just like humans, cats can be trained to use the toilet, with no mess and no accidents. Many cat owners were successfully able to train their cats to use the same toilet they use. Indeed, you can find in Amazon customer reviews many accounts of success stories related to the products to be presented here. There are many good reasons why you should toilet train your cats. The most important of all is that each time your cats step on the litter, their paws may get soiled, and when they are done with their business, they may carry some of the germ filled dirty litter all over your home. By training your cats to use the toilet, you create a healthy environment in your home. Note that this becomes critical if someone in your household has a low immune system or is pregnant. With toilet trained cats, you don't have to worry about the hassles of changing and disposing of the contents regularly, and you will no more have a smelly home! Also, litter is messy, and specially in small homes or apartments, it takes up precious space that can be used for something else. Finally, by not having to spend on litter any more, you save a lot of money in the long term. Even though, most cat owners are used to dealing with the above concerns, wouldn't it be fantastic if you could teach your cat to use the toilet so that all these problems and annoyances are eliminated? All the above arguments probably makes sense to you, but is it really possible to train a cat to use the toilet? Well, read on below! 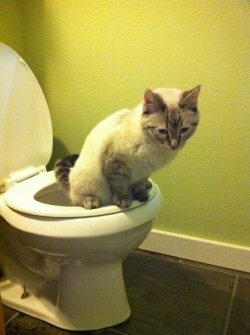 Is Toilet Training a Cat Possible? Cats have a natural need to hide the smell of their waste which is why they try to bury it in litter or elsewhere. This need has its origins in nature when cats were wild and free and needed to hide their waste to become untraceable by potential predators. These facts have scientifically been proven and can be used to toilet train cats. Therefore, using the major cat toilet training systems and kits available today, you can modify the cat's behavior in small behavioral steps until the animal starts using the toilet by discovering that the water in the toilet pan is more efficient than litter for hiding the smell. The time required to train your cat will depend on the particular physical and behavioral characteristics of your cat, such as age, intelligence, temperament, etc., but most cats get successfully trained in about 8 to 10 weeks, as long as you keep at it with patience and determination. It will take longer, though, if the cat is older than 8 years or never litter trained. It is recommended that a cat should be at least three months old before toilet training starts to make sure that the animal is strong, agile and nimble enough to go through the training. Also ideally, cats should already be litter trained before they are toilet trained. This is because the toilet training systems use cat's existing litter tray behavior and modifies it to use the toilet. But most kittens sold by breeders are already litter trained when you buy them, so this is not a major problem. Litter Kwitter and CitiKitty are the most popular cat toilet training systems and kits available on the market today, and they are presented below. The Litter Kwitter is the award-winning 3 stage training system designed to train cats to use a human toilet in about 8 weeks. The training protocol and the equipment were developed with animal behaviorists, veterinarians and cat breeders to make sure they work with the cat's natural instincts. The three stages involve progressing your cat to using 3 different training discs inserted into the provided special white seat until no more special seat or training discs are required. The red training disc is used first. It has no hole in it and is covered with some litter. The cat is easily trained to jump on it and do its business into the litter. The other two discs (amber and green colored) have holes in the middle, with the green disc having the largest hole. Some litter is placed around the hole. By the time the cat is trained to progress from the red disc to the green disc, most of the urine and feces fall into the water. Eventually, the special seat and the discs are completely removed, and the cat uses the toilet like every other member of the family! The Litter Kwitter comes with a special white seat that fits all standard toilets, three color-coded discs, a comprehensive instruction book, and a step-by-step training DVD so you can see how to do it. The DVD training is very easy for cat owners to understand and apply. Note that Litter Kwitter can also fit elongated toilets, so long as it’s width is no more than 38cm (15”) on its outer rim, by 25cm (9¾”) on its inner rim. Any gap behind the tray on an elongated toilet will not impact training. Mark Townsend, CEO of RSPCA, the world's most important animal welfare agency, has personally recommended this product to help cats to be toilet trained, and he considers it as one of the best pet innovations in recent years. Note also that Litter Kwitter is used by many professional cat breeders so they can provide their customers with toilet trained cats. CitiKitty offers a five-step gradual transition system from litter box to toilet using a special training seat and a special insert in the form of rings. It can be used with cats of all breeds, temperaments, sizes, and ages. In one-week intervals of training most cats progress from ring 1 to ring 4 and at the end of the training no more seats or rings are needed! 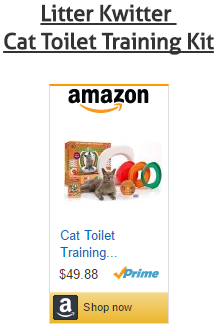 This product comes with a specially designed training seat and a training seat insert that gradually transition your cat to the toilet. The seat fits all standard toilets whether round or elongated. The training seat insert is made of concentric different size rings which allow you to move backwards and forward in the training process. An easy-to-follow training guide with step by step instructions is included together with an Insider Tip Card with training transition tips that will answer all your questions. Finally, the product comes with CitiNip, a naturally grown catnip to motivate and reward your cat throughout the training. The kit is very simple to use. You basically place the training seat with the ringed-insert on the rim of your toilet just under the seat. You fill it with some litter and gradually open the rings in the middle to let the cat start going in the water until all rings and special seat are completely removed. Any healthy cat, three months of age or older, that has been using a litter box, is a good candidate for this type of toilet training. So which cat toilet training system is better? As can be seen from the above descriptions, both products use the same method of gradually progressing your cat to adapt to new litter environments (implemented either by a special seat and color discs as in the case of Litter Kwitter, or by a special seat and rings as in the case of Citi Kitty) until no special seat, discs or rings are needed. However, the Litter Kwitter is more sturdy, it has a design that holds the discs better in place, and it provides better protection from litter falling into the toilet bowl. It also provides detailed step by step instruction videos which show you exactly how to progress through the three stages of training. Even though the Citi Kitty comes with a step-by-step training guide and an insider tip card, viewing the detailed training steps on video is a lot more helpful than just reading a guide. Of course, all this makes the Litter Kwitter more expensive, but the difference in money is worth what you get for it. Finally, note that not all Amazon customers who have used these products were successful and happy with the results. At the time this article was written, 49% of Amazon customers who have used Litter Kwitter and 46% of Amazon customers who have used CittyKitty had given a 5-star or 4-star rating to these products (in a 1 to 5 star rating system) and were more than happy with the results. But, the rest of them gave either a 3-star, 2-star or 1-star rating. This can be explained in part by some of the important but difficult to control factors that come into play here, such as your determination and patience levels as well your cat's character which will impact its adaptability to the new setup. Before you decide if you should get a cat toilet training kit, to gain more insight into these type of products, we recommend you read some of the Amazon customer reviews which you can access by clicking the Amazon product links you will find in the next section below. Please click the Cat Toilet Training Kits below to check their exact price or to purchase. ​And here is something for those who would you rather use a scoop-free litter box? If you'd rather get a scoop-free litter box for your cats, you might want to red the following article: Compare Scoop-Free Litter Boxes.